1. 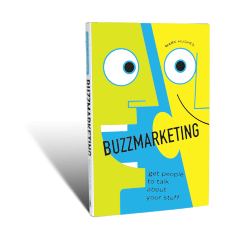 Buzz Marketing, Mark Hughes - This book was the catalyst for starting Darwin Dating. Mike and I read the book and immediately started brainstorming ideas that would fit the criteria. We roped in another friend James Duffy and Jodie and decided a tongue in cheek online dating site for attractive people would be a good way to experiment with the theory. 2. The Purple Cow, Seth Godin - I'm pretty sure I read The Purple Cow after Buzz Marketing, but the theory is similar and it helped keep the concept of being different in our minds and I'm sure influenced our thinking behind Shoes of Prey. 3. Maverick, Ricardo Semler - This was the first book that got me thinking about how important it is for people to love the work they do, because it makes the world both a happier and more productive place. Having read this book, then talking to Mike about his experiences working at Google I had my resume in there quick smart. 4. Made in America, Sam Walton - Sam Walton was the founder of Wal-Mart, the largest retailer in the world. I read this book shortly after starting at Supercheap Auto. Sam's story is an incredible one and it helped ignite my passion for the retail industry. 5. Family, Village, Tribe - The story of Flight Centre, Mandy Johnson - Another great and inspiring retail story. In addition this book got me thinking about how people work best in teams. Flight Centre subscribe to the theory and provide a great case study of how people should work in groups of a similar size to how people have lived for 1000's of years - a family sized group of 5-7 that sits within a larger community or village of 20-30, that is part of a broader tribe of a few hundred. There are many other great business books out there. What are your favourites? Now then, I love business books. I remember a great falling out with a really cute ex-girlfriend who couldn't believe that I took a book on organisational psychology on holiday with me, and got really excited by the chapter on Plato's Cave. Anyway, my favourites are probably more around the linkage between human behaviour, society and business, so I am a sucker for the Freakonomics series. I know some of their discussions are flawed, but what they really teach you is that a lot of the linkages we make in life are completely without reason and often the equal and opposite thing can happen. Definitely worth a read! I'd add Truth, Lies and Advertising by Jon Steel. And anything Malcolm Gladwell has penned (although they're not always strictly related to business, but the his principles are always easily applied). Tipping Point is great, I love Gladwell's story telling style. Its designed to influence and move the reader to a certain position, as opposed to hard facts. I also like F.I.A.S.C.O: Blood In The Water by Frank Partnoy and Infectious Greed, and Liar's Poker by Michael Lewis! These have more a finance bent, though still great business books. Going to have to blog my own list now! I still find the classic Cluetrain Manifesto (levine,locke, searle, weinberger) and The Long Tail(Anderson) inspiring. Thanks for sharing!